(0) 3 15/16"- 4 1/8" 4 1/8" - 4 5/16"
(1) 4 1/8" - 4 5/16" 4 5/16' - 4 1/2"
(2) 4 5/16" -4 1/2" 4 1/2" - 4 3/4"
(3) 4 1/2" - 4 3/4" 4 3/4" - 4 15/16"
(4) 4 3/4" - 4 15/6" 4 15/16" - 5 1/8"
(5) 4 15/16" - 5 1/8" 5 1/8" - 5 5/16"
(6) 5 1/8" - 5 5/16" 5 5/16" - 5 1/2"
(7) 5 5/16" - 5 1/2" 51/2" - 5 11/16"
(8) 5 1/2" - 5 11/16" 5 11/16" - 5 15/16"
(9) 5 11/16"- 5 15/16" 5 15/16" - 6 1/8"
(10) 5 15/16" - 6 1/8" 6 1/8" - 6 5/16"
Every Old Mac’s horse boot has a unique hi-tech performance outsole, incorporating the unique Hoof Suspension™ System. The specially developed Thermo Plastic Urethane (TPU) compound will minimize and help speed up recovery from concussion-related injuries. If your horse suffers from any of the following - arthritis, pedal bone fractures, jarred shins, navicular disease, ringbone, knee fractures, laminitis (founder), bruised soles or hoof walls and scalping from overreaching – an Old Mac’s horse riding boot will benefit your horse. 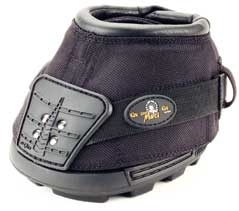 Aimed at improving your horse’s soundness, well-being and performance, these boots will extend your horse’s working life! When used during transport, Old Mac’s will eliminate the problem of your horse throwing a shoe in the trailer. When you arrive at your destination, your horse will be ready to work. Old Mac’s protect your horse from bulb and tendon damage, as well as hoof wall and sole bruising. Their exceptional traction will help prevent slipping on the loading ramp and offer increased confidence inside the trailer. Please note that the use of boots over shoes voids the wear warranty. You can protect both the stallion and mare against kicking injuries during breeding by fitting Old Mac’s Multi-purpose Horse Boots. The unique outsole design will also significantly improve traction during serving.